10.30am to 3pm and 6pm to 10pm (Saturday, Sunday and public holiday). FEEL like pampering yourself but do not want to burn a hole in your pocket? Empire Hotel’s Di Wei Chinese Cuisine Restaurant now offers a chance to do just that. Savour the delicate flavours of their latest creation, Braised Abalone and Fish Maw served with Fried Rice, at just RM58.80++ per set. Executive Chinese chef Thian Taik Yong said the creation was inspired by the famous dish, Braised Shark’s Fin Soup with Rice, which in Hong Kong carries the connotations of astounding success and bountiful wealth. “We have replaced shark’s fin with abalone for environmental reasons. ‘It is traditionally used to fight colds, treat heart condition and improve blood circulation. Also, the phosphorus-rich abalone is good for the bones and helps arthritis patients,”he said. Perfect taste: The refreshingly sweet and tangy sauce matches perfectly with the duck?s crispy skin glazed with a layer of maltose syrup. Served in a dainty pot, the abalone from Australia and fish maw from India tempt with its tender textures. These are thoroughly infused with premium oyster sauce as well as flavoured with pork and Chinese ham, by boiling for two hours. There is something special about the fried rice, too. The rice is fried with just egg white while the yolk is made into a crepe to wrap the rice. The dish also reflects the young chef’s culinary style, one that respects tradition and at the same time is creative. Another unique delicacy is the Honey Apple Cider Crispy Roast Duck, to be introduced in April. This creation by BBQ expert chef Lai Yoke Wei pleases with the refreshingly sweet and tangy sauce, which matches perfectly with the duck’s crispy skin glazed with a layer of maltose syrup before roasting. Sweet finale:If there is roomfor dessert, trythe ChilledDargonfruit orMango withLight SagoCream. The secret lies in the addition of apple cider beer to the blended apple and honey sauce, which is used to marinate the duck overnight. The dish is priced at RM70++ (whole bird) and RM40++ (half). Prior booking is required. Complete your experience at the swanky restaurant with its all-time favourite Spinach Beancurd with Konpoi and Mushroom, a light-flavoured dish that involves careful preparation. 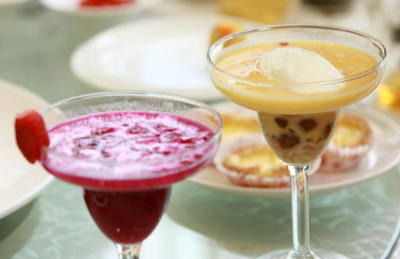 If there is room for dessert, do not miss the Chilled Dragonfruit or Mango with Light Sago Cream or if you want something warm, try the Green Tea with Custard and Salted Egg Yolk. Di Wei Chinese Cuisine Restaurant, Empire Subang, Jalan SS16/1, Subang Jaya. Tel: 03-5565 1388. Business hours: 11am to 3pm, 6pm to 10pm (Monday to Friday); 10.30am to 3pm and 6pm to 10pm (Saturday, Sunday and public holiday).